I will be posting a new summer cooler interview in the next 24 hours, but was rummaging through some old files and thought it might be fun to dig up this Q & A- the first extended interview Patrice Bergeron did with anyone outside the usual post-pick media scrum after becoming a Boston Bruins pick in Nashville 12+ years ago. I totally lucked out in that we stayed at the same hotel and I ran into him in the hallway, otherwise it is an opportunity would have missed out on. But, in getting to spend time with Patrice, it began a name-basis relationship right off the bat at a time I will still relatively new to covering the NHL. I guess you could say I got in on the ground floor with Bergeron and it’s been a real treat to watch him grow. This should dispel the lingering myth with anyone that he couldn’t speak English very well when the Bruins drafted him. I transcribed every word of his answer off the tape recorder (yes- I was still using mini cassette tapes back then), and while he had a thick accent and his grammar wasn’t perfect, he communicated quite fine. It gets back to how serious and hard working he is…he studied hard in school and applied himself when playing major junior hockey in the Maritimes. Bergeron’s smarts and work ethic define the person and player he is. When you get right down to it, he’s the classic player who wasn’t a household name because of several concerns going in- mainly his average size and skating- but he was one of the few from that storied 2003 draft class who was an NHL player right away at 18 after going from midget AAA to the QMJHL the previous two seasons. That kind of thing doesn’t happen often and it isn’t an accident when it does. So, enjoy the Q & A and I’ll have a newer post up later on a player that New Englanders, Hockey East fans and Albertans will have an interest in, but is not a Bruins player/prospect. 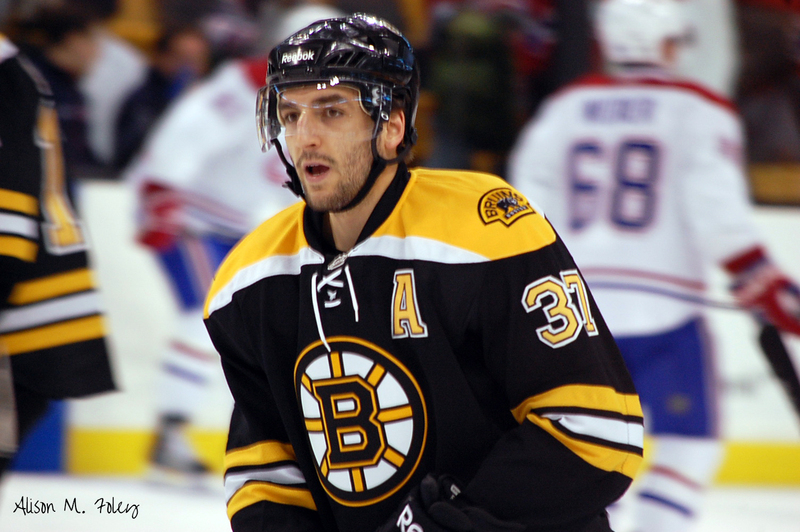 A household name he wasn’t, but heading into the 2003 National Hockey League Entry Draft in Nashville, Acadie-Bathurst Titan Patrice Bergeron had a feeling that he might have a very good day when all was said and done. Just 45 selections into an event that would see nearly 300 young men from across North America and Europe have their names called by NHL teams, Bergeron’s wait was over, taken by the Boston Bruins mid-way through the second round. Bergeron, who doesn’t turn 18 until next month, describes himself as a hard-working playmaker who finds more joy in setting up his teammates for goals than scoring them himself. Although a bit slight at 6-feet-0 and 180 pounds, Bergeron has drawn raves from scouts for his soft hands, creativity and ability to affect the tempo of the game when he controls the puck. One knock on the Quebec City native’s game is that he must get faster, particularly in his acceleration, if he is going to realize his immense potential. The young center already has an excellent grasp on the English language, despite not getting much of an opportunity to use it in his native Quebec. This should help reduce the effects of culture shock when he travels to Boston for his first professional training camp in the fall. Although not widely known amongst draftniks, Bergeron impressed his coaches and scouts in the Quebec League playoffs, and appears to only be scratching the surface in terms of what he can become in the NHL someday. It will take a little time, but don’t be surprised if Bergeron arrives on the scene sooner than anticipated. He appears to have all the intangibles that you look for in a professional athlete, and his humble nature off the ice conceals a fierce competitor on it. HockeyJournal.com sat down with Patrice Bergeron in the Millennium Maxwell House hotel in Nashville the day after the draft and talked shop with one of the newest Bruins in the system. HockeyJournal.com: What was your overall impression of the Entry Draft and the atmosphere there? Was it everything you thought it would be? Patrice Bergeron: It was a lot of fun to go there to Nashville and then to be pick in the second round by the Boston Bruins. I wasn’t too nervous, but still, you wait and you don’t know when you might get pick, so to hear my name in the second round was a great feeling for me. HJ: You said in the initial interview after you were selected that you were from Quebec City. Are you from the city proper, or a suburb? PB: I live in Sillery, Quebec. It is a town not too big, but outside Quebec City. HJ: When did you start playing hockey? PB: At the age of five, I was. HJ: So that was probably around 1990. Did you like the Quebec Nordiques back then? PB: Yeah, I did. I liked (Joe) Sakic. He was probably the one I liked the most. But, I liked Adam Foote too. He worked really so hard and was a leader. HJ: What was the difference for you, or the hardest thing to adjust to in your first season of major junior as opposed to what you were used to in midget hockey before? PB: Probably the execution of the play was the hardest thing. You have to pass quicker, shoot quicker and all that kind of stuff. HJ: How about the physical play and the fighting? Was that a change for you? PB: Probably more the fights was the only difference because yes, the guys are bigger, but I was used to it. The physical stuff doesn’t bother me at all. It’s part of the game. HJ: One of the NHL scouts who saw you play quite a bit this season said that you are very creative, and although you may not be the fastest skater, you slow the game down because you move side-to-side well and are able to hold the puck so you can make that key pass at the right moment for a good scoring chance. Do you think that’s a pretty accurate assessment of you and your play, and how much of that creativity that you possess is something that you were born with and just do when you’re out on the ice? PB: Yeah, I think that is right. I think that a lot of what I do is natural, but I always work and prove my place. But I think that the things to look and slow down the play is natural, but the other parts of the game have to come when you work hard. It’s like when you learn on the job and as you work more, you get more confident and better at your job. With me, it’s the same thing. HJ: What kind of a relationship do you have with your head coach in Bathurst, Real Paiement? PB: It’s a great relationship. He helped me with a lot of things this year on the ice, but outside in general life. He’s a really good coach and I have a really great relationship with him. HJ: That relationship probably showed through in the playoffs, when as a rookie, you were given a lot of ice time even though it was your first taste of the postseason, and you responded by playing a big role in your team’s success. How important was that faith he showed in you for your overall confidence? PB: It gives me confidence. At the beginning of the year, he told me I would be on the third line, and improve my play and get experience and get confidence. He gives me so much confidence that I take my place and I graduate on the top line and get some ice time in the end of the regular season and playoffs. HJ: As far as your offense goes, you’ve said you’re more of a playmaker, a passer- but when you are looking to shoot, what are you most comfortable with doing, and what shot have you had the most success with in game situations? PB: My wrist shot. You know, a shot without showing the goalie you’re going to take a shot. HJ: This summer, you said you wanted to work on your skating, but what are some of the other things you want to improve on? PB: My body and my physical strength. I got a physical trainer in Quebec City- his name is Raymond Veillette. He’s a very good guy- he has been training with Simon Gagne. HJ: Simon Gagne is a very accomplished hockey player. Do you know him? PB: It’s the first summer for me, but I’m not like his friend, but I do know him. I have a lot of respect for him because he work very hard and is a great NHL player even though some people say he couldn’t make it because he was small. I look at him and hope that I can be like that too, someday. HJ: What are your expectations of your first professional training camp in September? Are you pretty excited about being able to put on that Bruins sweater and skate with guys like Joe Thornton, Glen Murray and the rest of the team? PB: It’s a wonderful feeling for me. When you’re young, everybody dreams about it, but doesn’t think too much because it’s far and you don’t know what is going to happen. But now, I’m here, and I know it’s only the first step that I’m draft, there are a lot of things I have to do to move on. But to go to camp is going to be impressive. I just have to get as strong as I can in the summer, and work on my skating as much as I can. I won’t be able to be as good as I want in one summer- it takes some years to do that, but I think I will be improved and make a good impression in Boston. It is important to me that I just play my game, work hard and show them that I can play. HJ: What are some of the things you like to do when you’re not playing hockey? PB: I like to listen to rap music, like Eminem and DMX. HJ: You seem to have a pretty good relationship with your older brother, Guillaume. Do you beat him up now that you got a little size on him? PB: (chuckling) No, I don’t beat him up or anything. Yeah, we’re very close. He is focus in his studies right now. He goes to college for business in Quebec City. HJ: Have you seen any good movies recently? PB: I saw “Old School” on VHS the other day. HJ: What did you think? Was it good? Silly? Terrible? PB: It’s good. You know, it’s crazy humor, but it was pretty funny. I like more comedies than anything else when I see movies. HJ: Do you have any final thoughts on being a Bruin? PB: Only that it’s a great feeling to be pick(ed) by the Bruins and I know that I can work very hard to prove to the fans that I’m a good player for the organization. HJ: Sounds good, Patrice. Thanks for your time. Bergeron: It’s okay. Thank you.